This shade arbor, located in The Woodlands, TX north of Houston, spans the entire length of the back yard. 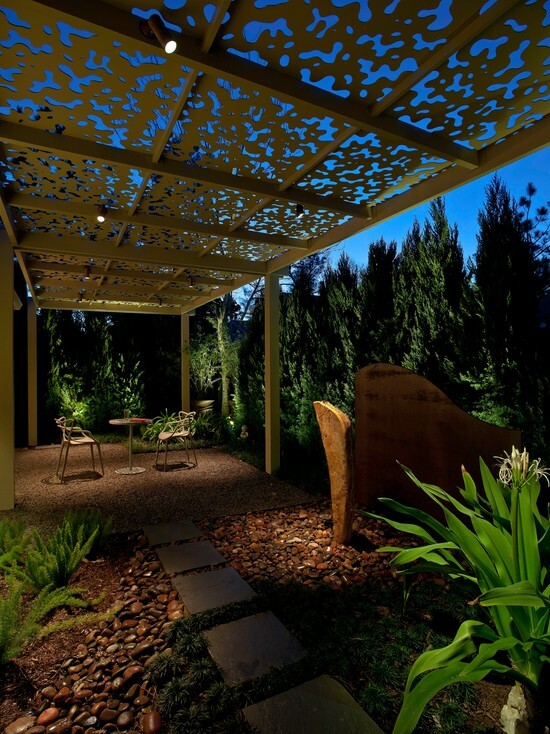 It combines a number of elements with custom structures that were constructed to emulate specific aspects of a Zen garden. 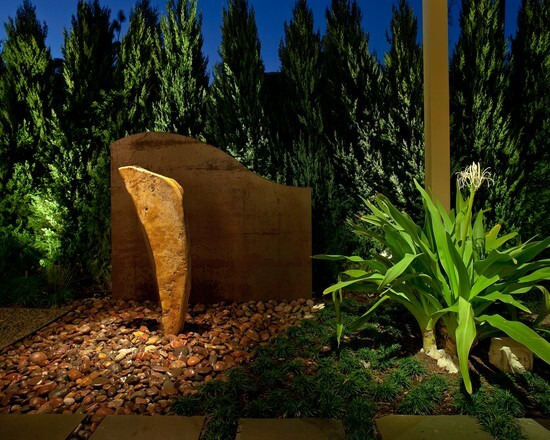 The homeowner wanted a low-maintenance garden whose beauty could withstand the tough seasonal weather that strikes the area at various times of the year. 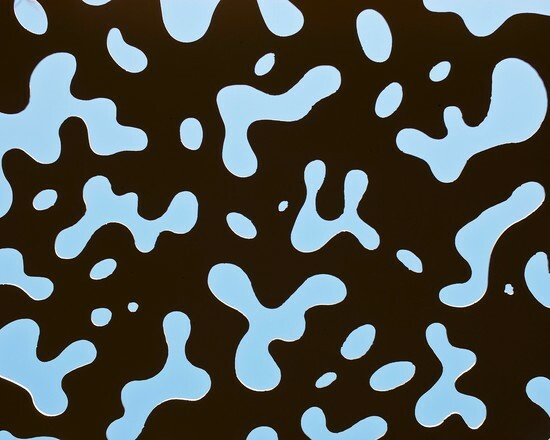 He also desired a mood-altering aesthetic that would relax the senses and calm the mind. Most importantly, he wanted this meditative environment completely shielded from the outside world so he could find serenity in total privacy. 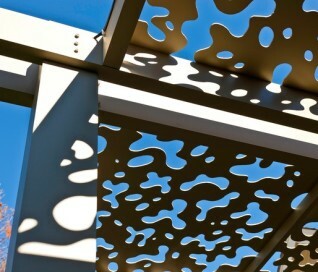 The most unique design element in this entire project is the roof of the shade arbor itself. 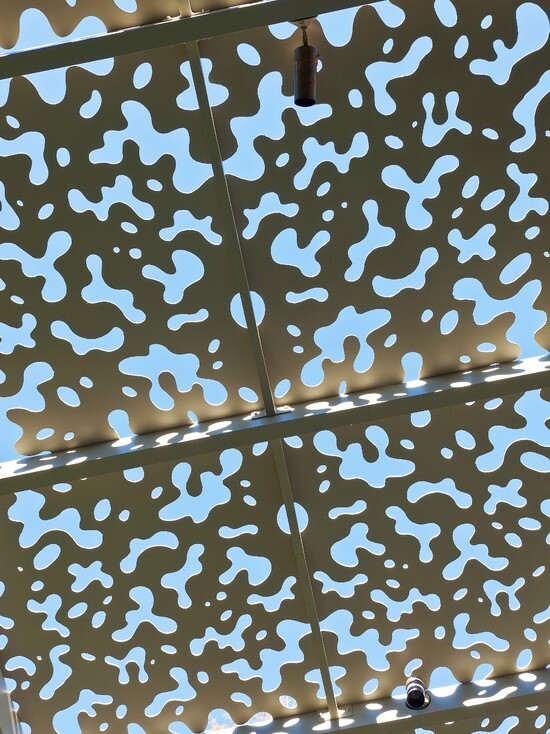 It features a “negative space” leaf pattern that was designed in a software suite and cut out of the metal with a water jet cutter. 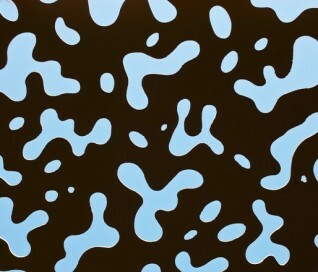 Each form in the pattern is loosely suggestive of either a leaf, or a cluster of leaves. 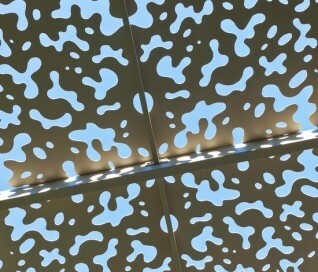 These small, negative spaces cut from the metal are the source of the structure’ powerful visual and emotional impact. 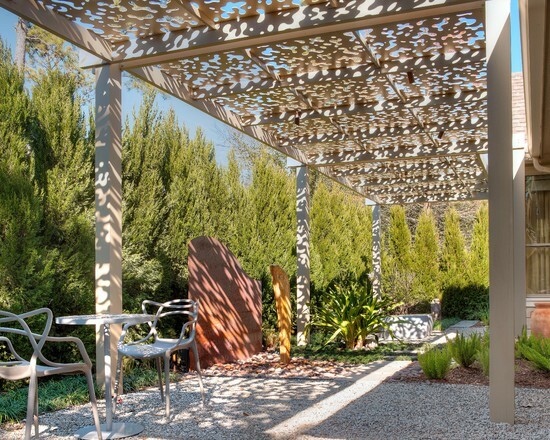 During the day, sunlight shines down and highlights columns, furniture, plantings, and gravel with a blend of dappling and shade that make you feel like you are sitting under the branches of a tree. At night, the effects are even more brilliant. 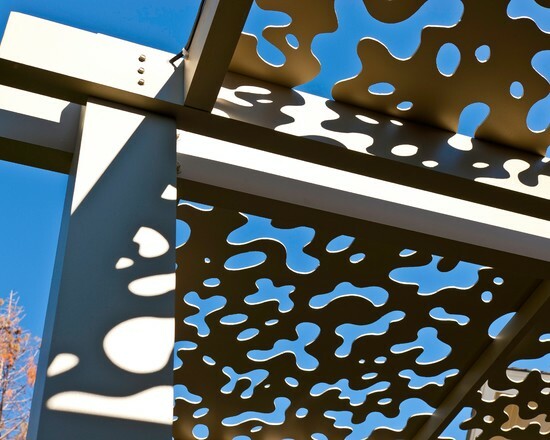 Skillfully concealed lights mounted on the trusses reflect off the steel in places, while in other places they penetrate the negative spaces, cascading brilliant patterns of ambient light down on vegetation, hardscape, and water alike. 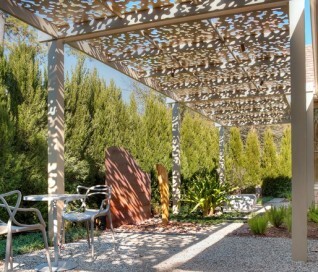 The shade arbor shelters two gravel patios that are almost identical in space. The patio closest to the living room features a mini outdoor dining room, replete with tables and chairs. 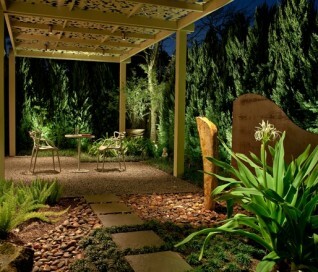 The patio is ornamented with a blend of ornamental grass, a small human figurine sculpture, and mid-level impact ground cover. 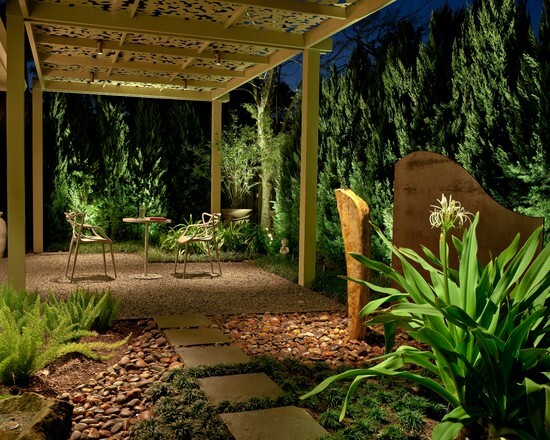 Gravel was chosen as the preferred hardscape material because of its Zen-like connotations. It is also remarkably soft to walk on, helping to set the mood for a relaxed afternoon in the dappled shade of gently filtered sunlight. The second patio, spaced 15 feet away from the first, resides adjacent to the home at the opposite end of the shade arbor. Like its twin, it is also ornamented with ground cover borders, ornamental grasses, and a large urn identical to the first. Seating here is even more private and contemplative. Instead of a table and chairs, there is a large decorative concrete bench cut in the shape of a giant four-leaf clover. Spanning the distance between these two patios, a bluestone walkway connects the two spaces. 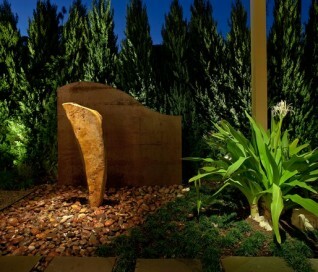 Along the way, its borders are punctuated in places by low-level ornamental grasses, a large flowering bush, another sculpture in the form of human faces, and foxtail ferns that spring up from a spread of river rock that punctuates the ends of the walkway. 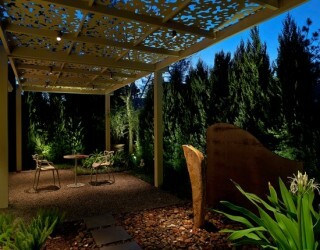 The meditative quality of the shade arbor is reinforced by two special features. The first of these is a disappearing fountain that flows from the top of a large vertical stone embedded like a monolith in the other edges of the river rock. The drains and pumps to this fountain are carefully concealed underneath the covering of smooth stones, and the sound of the water is only barely perceptible, as if it is trying to force you to let go of your thoughts to hear it. A large piece of core-10 steel, which is deliberately intended to rust quickly, rises up like an arced wall from behind the fountain stone. The dark color of the metal helps the casual viewer catch just a glimpse of light reflecting off the slow trickle of water that runs down the side of the stone into the river rock bed. 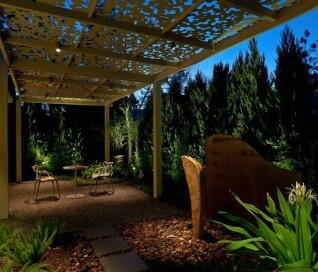 To complete the quiet moment that the shade arbor is intended to invoke, a thick wall of cypress trees rises up on all sides of the yard, completely shutting out the disturbances of the world with a comforting wall of living greenery that comforts the thoughts and emotions.